The app includes the ability to display analytics on both matters and motions. For matters, you can retrieve statistics on the average length of a matter in the venue or ruleset for that matter. You can see the statistics at three levels: across all of LawToolBox on an anonymized basis, across all matters in your firm, and for any matters that has been shared to you. Motion analytics give you the average length of a motion, from date of filing until the date of the order, in the venue or ruleset for that matter. For either of these sets of analytics, you can see the statistics at three levels: across all of LawToolBox on an anonymized basis, across all matters in your firm, and for any matters that has been shared to you. 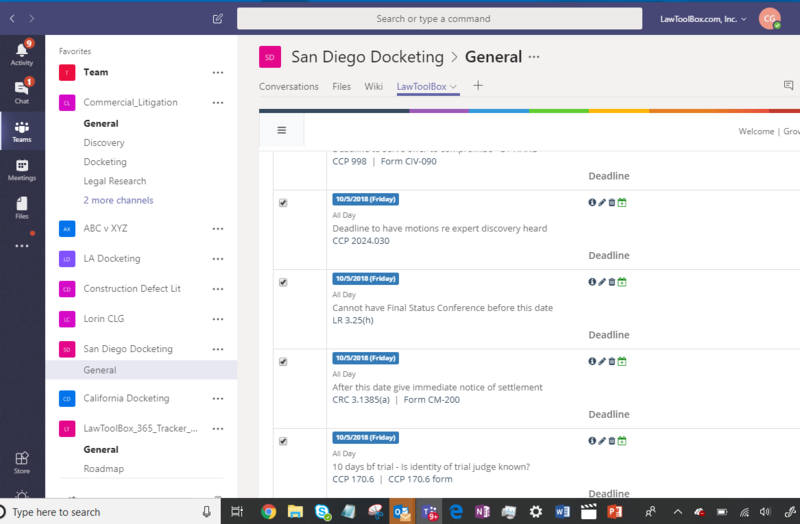 “This integration with Microsoft Teams is a powerful and crucial step in our mission to help good attorneys become great attorneys, and to deliver next-generation deadline management tools for law firms and corporate legal departments,” Grow said in a statement announcing the app. Read more about it at the LawToolBox website. Information on subscription pricing for the Office 365 edition of LawToolBox can be found here.